Today in Masonic History Llewelyn Sherman Adams passes away in 1986. Llewelyn Sherman Adams was an American politician. Adams, who went by Sherman Adams, was born on January 8th, 1899 in East Dover, Vermont. He went to public schools in Providence, Rhode Island and graduated from Hope High School. In 1920 he graduated from Dartmouth College. His time at Dartmouth was interrupted by Adams six months of service during World War I in the United States Marines. After graduating, Adams held various jobs in the lumber industry. First in Healdville, Vermont and later in Lincoln, New Hampshire. 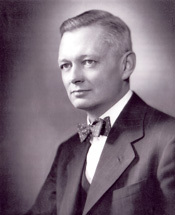 In 1941, Adams served in the New Hampshire House of Representatives, serving until 1944. In 1944 he served as the Speaker of the House. In 1945 he served in the United States House of Representatives from 1945 to 1947. In the middle of the term he attempted to run for Governor of New Hampshire and failed in his bid. In 1948 he ran again, this time successfully. Adams took over in New Hampshire during the post World War II depression. He pushed for frugality and thrift in all levels of government. He also pushed for additional benefits for the elderly. From 1951 to 1952 he served as the chairman of the U.S. Conference of Governors. Two Democrats were talking and one said "Wouldn't it be terrible if Eisenhower died and Nixon became President?" The other replied "Wouldn't it be terrible if Sherman Adams died and Eisenhower became President!" Adams and Eisenhower were a powerful team and took on a variety of what they called "flamboyant personalities." One of those personalities was Senator Joseph McCarthy. Adams and Eisenhower went after McCarthy after McCarthy attacked the United States Army. In 1958, Adams was forced to resign when it was revealed that he had taken a vicuña overcoat and an oriental rug from a Boston textile manufacturer who was under investigation by the Federal Trade Commission. In front of Congress, the textile manufacturer refused to answer questions regarding his relationship with Adams. After Adams resigned he returned to Lincoln, New Hampshire and started the Loon Mountain Corporation which is a major ski resort today. Adams passed away on October 27th, 1986. Adams was a member of Parker Lodge No. 99 in New Hampshire.